What PostgreSQL Triggers and Actions are Supported? New or Updated Row - Triggered when a new row is added or modified. New Column - Triggered when you add a new column. New Table - Triggered when you add a new table. New Row - Triggered when you add a new row. Update Row - Updates an existing row. New Row - Adds a new row. Find Row via Custom Query - Finds a row in a table via a custom query you control. Find Row - Finds a row in a table via a lookup column. 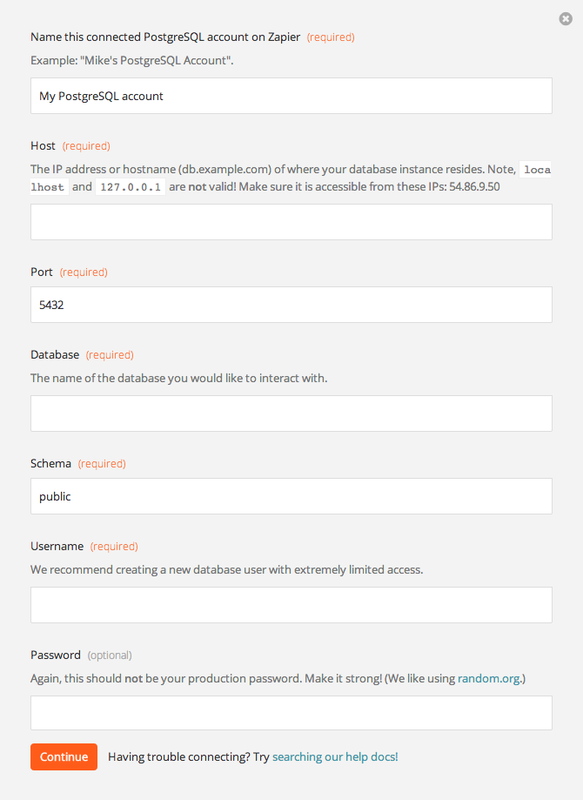 Host The IP address or hostname (db.example.com) of where your database instance resides. Make sure it is accessible from outside your network. We send out database connections from the IP addresses listed here. Database Name of the database to read data out of. Schema The schema inside PostgreSQL to search for tables. Username Username with access to the database. We recommend creating a brand new Zapier-specific user with highly limited permission scope. Password Similar to the username, make this a unique strong password (check out https://random.org). This password should not contain spaces. Note: all fields are stored encrypted in our database. Of course, we have the encryption keys on hand but they are stored separately to minimize risk. Nonetheless, we recommend not hooking a production database to Zapier. Instead, set up an intermediary database to connect with Zapier then dump data back to your main production database using some out-of-band process. 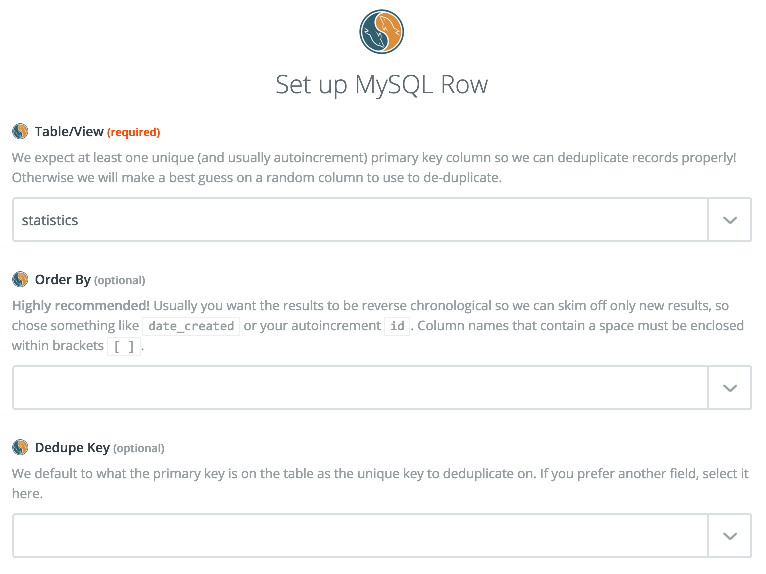 The Zapier MySQL integration doesn't currently support version 8.0+ Your database will need to use an earlier version in order to use it with Zapier. Important: Don't forget to do both things: open up your firewall and add the IPs to your user GRANT permissions. You might try granting all privileges to verify the Zap is working, then narrow down on just the permissions you actually need. For PostgreSQL, you'll need to configure the server to accept logins from remote IPs (in pg_hba.conf), and create a user for Zapier to use. Important: If you are hosting your database on Amazon AWS please follow the steps for using Amazon RDS/EC2 below. Be sure your database isn't bound to only listening to 127.0.0.1 - commonly you want to bind it to 0.0.0.0 or * or remove that restriction completely. Check your my.conf, postgresql.conf or similar configuration. You need to make sure we can access the database from 54.86.9.50/32. If you are using Amazon RDS or EC2 for your database, you need to add 54.86.9.50/32 to your security group. First, find out if you are on the VPC or Classic Platform. Select the security group that you are using for your database instance and add the above IP as a CIDR/IP authorization. Test your connection and if the steps above were completed correctly you should be good to go! If you are on the VPC platform, please make sure that it is publicly accessible and within a public subnet in addition to whitelisting the above IP. See Scenarios for Accessing a DB Instance in a VPC for more details on for both VPC and Classic. If hosting MySQL on GCP you need to add the IP (54.86.9.50) to the "Authorised networks" section on the "connections" tab within CloudSQL. Check for typos, permissions, and spaces at the end of fields and make sure they are all entered correctly. It isn't uncommon to see queries take much too long for Zapier to correctly operate - you should ensure your queries run well under the 30-second limit we impose. Remember, if you are doing WHERE clauses to add indexes on those columns, please be sure your id column has an index as well (normally that is a primary key and is automatic). You may setup a Zap and discover that new rows aren't triggering. Or perhaps they were triggering but all of the sudden stopped triggering. What's going on? You should double check your Zap's filters to make sure you have selected an Order By field. You can find this where you 'edit options' for the MySQL trigger. It is very important that you select a field here. When we query your database we'll only pull a set number of records at a time (since we cannot pull all of them) and with no field to order by we'll most likely get the default ordering. Your primary key would be an excellent choice here if it is auto incremented. Creation dates are also good candidates as well. But leaving this field empty could lead your Zap to stop triggering on new rows because it can't see them anymore. The "New Row" trigger sees the most recent 50 items which affects how the maximum amount of rows your Zap can trigger on at one time. See deduplication for more information. A common problem with database services on Zapier is deduplication. You can read more about deduplicate in general, here. This applies for all the database services on Zapier like MySQL, MSSQL, Postgres, etc. Zapier deduplicates off of the primary keys on the table you are triggering new items from. If you have multiple primary keys then a concatenation of all of them is used to deduplicate. The ramification is if you make a sweeping change to the primary keys on your table, you'll inadvertently Trigger tons of things through your Zap. Sometimes this is caught by Zapier's flood protection feature. Nonetheless, you should turn your off Zap before you make changes and turn it On again after the changes have been made. This allows Zapier to establish a new "baseline". If your table has no primary keys, Zapier will guess which column to use, usually looking for column names with id in it. Or whatever technique most closely approximates how you want Zapier to consider your rows unique!